VietNamNet Bridge – On a bright Sunday morning, 10-year-old Doan Nhat Minh joins his friends at an English class to take a walk around Hoan Kiem Lake in downtown Hanoi. Love to learn: Teacher Duyen (middle) guides her student to make a postcard during an extra class game. The weekend pedestrian street is bustling with locals and tourists going sight-seeing. Yet today Minh and his friend do not simply stroll leisurely around the lake. 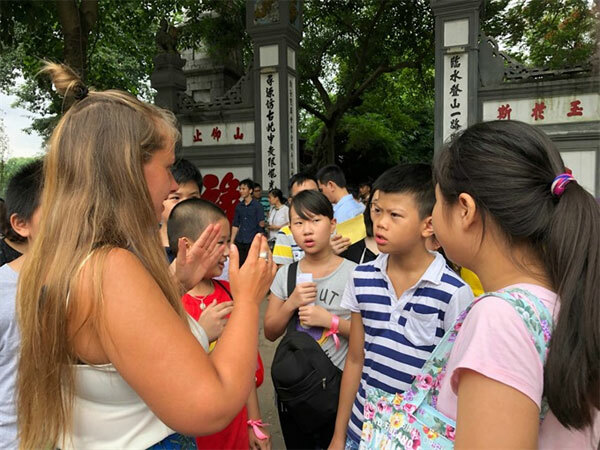 They eagerly seek out foreigners to talk with them, collect their signatures and compete for the award for the pair that speaks with the most foreigners. They stop every group of foreign tourists to start conversations and meet a warm response. Their topics range from favourite foods, colours and weather to impressions of Vietnam. The game is a regular activity of the free English class for children based in Phap Van Pagoda in the southern outskirts of Hanoi, launched by teacher Tran Thi Huong Duyen. 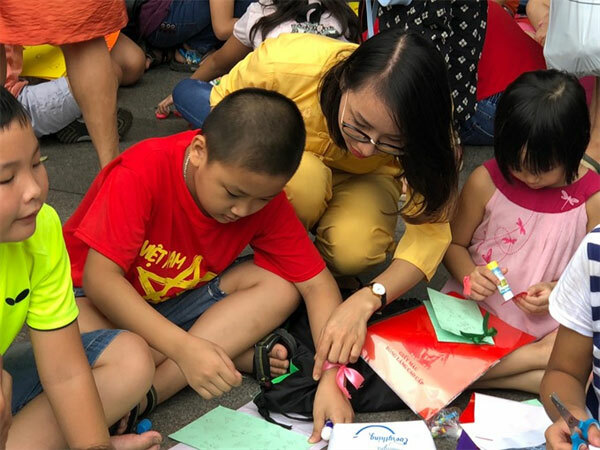 “We organise the extra class activities like this only ever three weeks, as we are lacking volunteers to manage the teams,” Duyen told Viet Nam News. Duyen said she runs three classes every Sunday morning for three age categories: kids grades 1 – 4, juniors grades 4-8 and teenagers grade 8 through high school. Duyen said all the teachers of the class work for free, serving students from all over the city. Duyen explained she wanted to use the pagoda space to run the class as she wants the children to not only learn English lessons but also develop a consciousness of ethics and justice at a young age. Le Ngoc Diem My, 10, has attended the class for one year and said that she was more confident speaking English with foreigners. “I’m longing for the class during the weekdays,” she said. Nguyen Thi Thanh Van, My’s mother, said she visited Phap Van Pagoda and by chance discovered the free English class. She said the teachers print out handouts and lure children with many games. 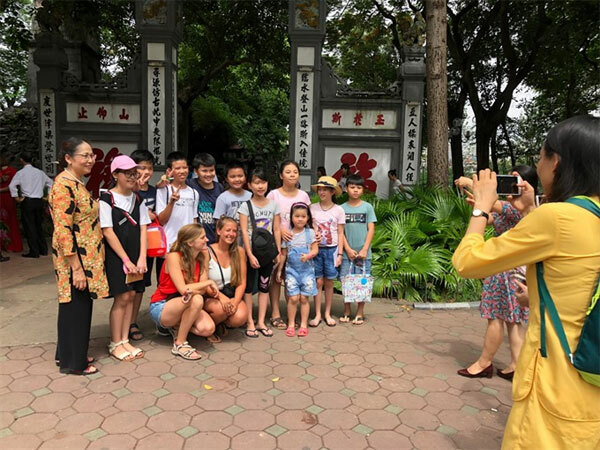 Say cheese: Duyen (right) takes a photo for her students and foreigners at Hoan Kiem Lake. Duyen said the organisers had struggled with many difficulties since launching the class in July last year. All 25 volunteers have co-ordinated with one another and received supports from the pagoda to run the class. Children learn from various handouts prepared by the teachers, which are combined with games to turn the class into an easy-going, relaxing and funny learning place. Duyen tries to keep each class for a maximum three months and enroll new students so that more and more children can get the knowledge freely. Volunteers are mostly teaching English at language centres in the city to earn their living. Duyen herself has joined various charity trips to other localities. “We teach students in the provinces and bring them the chance to exchange with foreigners,” she said. Duyen revealed that she wanted to open more charity classes in other areas of the city to meet the increasing demands of needy learners. “Many students in our class have to travel 20km away from the other side of the city,” she said. Parent Pham Xuan Quyen is grateful for the class. Duyen said that since last July the centre has hosted nearly 200 learners. “They just come and study and don’t have to pay anything,” she said. "I think Duyen’s project is very humane and she’s implementing it well," said Pierre Kornig, a retiree from France, who has joined the class as a volunteer. "I like children so I can try my best to help them."